Just a little history... After buying our new house last July and doing a few renovations... which stretched into A LOT of renovations, we finally moved in the day after Thanksgiving. Yup, Black Friday 2009. Honestly, I was prepared for the worst, but because we only moved 6 miles away, and because we didn't sell the old house right away, the move wasn't too stressful. Anyhow, I thought I'd post more Before & After photos... 'cause those are always fun to look at, right? Two of the main support posts had hairline fractures and the staircase was shaky... very shaky. We had to make the repairs anyway, so we decided to do a little upgrade. With the spindles removed and just 2 shaky posts holding everything up. We also had contractors installing crown moulding and baseboards during the staircase reno and 6-7 guys were going up and down the staircase... eek! And you wonder why they strongly prefer that you DO NOT live in the house while they work on the banister! SCARY! 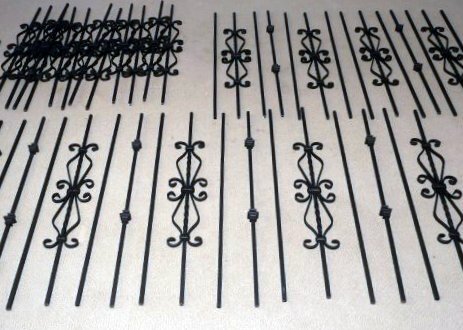 We designed the pattern for the staircase & rotunda... lots of options to choose from! 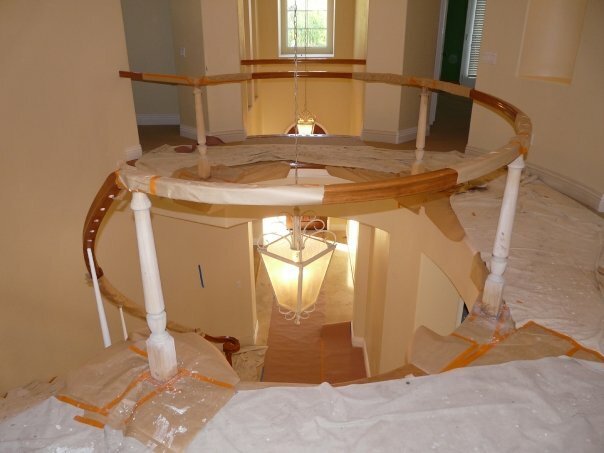 Aside from staining the previously white support posts and retouching a few spots that weren't stained (the new iron spindles have a smaller footprint than the original wood), the wood part of the railing is the original. Of all the projects, the staircase reno was definitely the most bang for the buck. 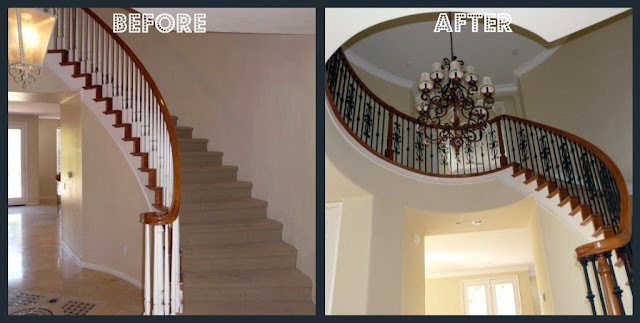 Replacing the spindles was a lot less costly than having the entire staircase remade. 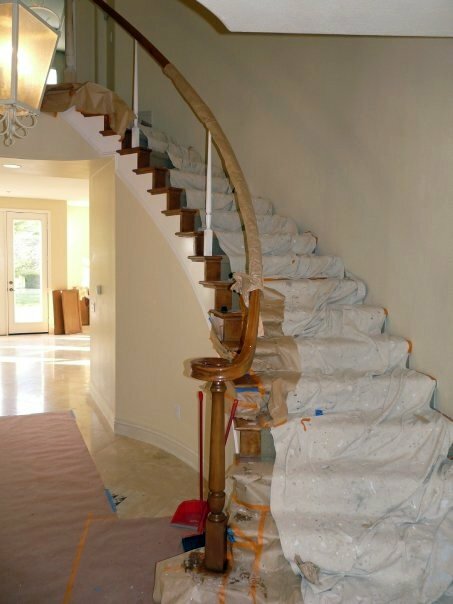 Our staircase is in the center of the house. Before the upgrade, you'd walk through without noticing it-- Now it's the focal point of the interior.